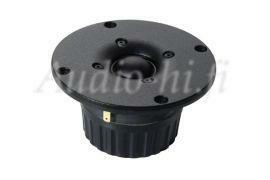 Low viscosity magnetic fuid provides excellent cooling and maintains low resonance frequency as well. Double magnet system of SEAS E006 increases sensitivity and provides better control of the voice coil. It also reduces the magnetic stray felds, making the Excel T25CF001 a best choice for high-end audio-video applications.